Tell me this: Have you taken a Lyft in the last year? Has Uber Eats delivered a meal to your doorstep (or office foyer, as the case often is)? When I need a ride or a bite these days, I am seriously thanking the convenience gods for the gig economy, where a whole community of people work odd jobs and odd hours to make a living and make my life easy. This same convenience phenomenon isn’t limited to the miles-and-meals variety. House-cleaners, errand-runners, even medical professionals, are available in this burgeoning new on-demand workforce — and marketers are reaping the benefits as well. 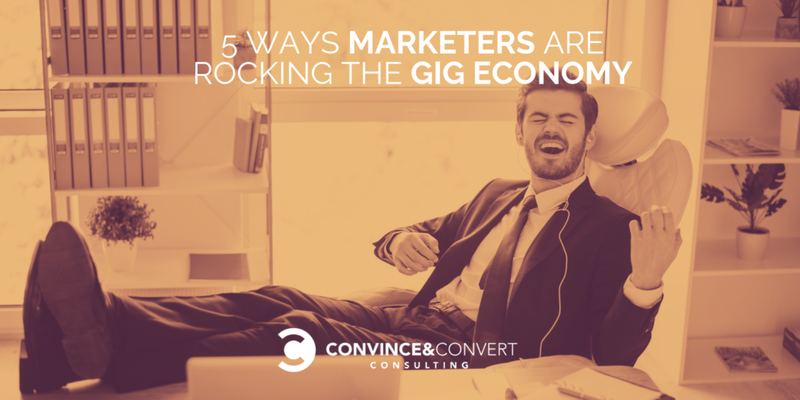 Our tribe has always been in demand and on demand, but over the years, gig-based marketers have shifted from primarily consultative services to task-based services. And it’s making our jobs more interesting, more varied and, frankly, more profitable. I recently collaborated with the good folks at Torchlite, which is an online marketplace for on-demand digital marketers, to put together an ebook about the value and convenience of hiring freelance marketing professionals. Or as Torchlite likes to call them, “flexperts”: flexible experts ready to lend their time, talents and “flexpertise” to any manner of marketing projects. Download your free copy of “Flexpertise: Your Guide to On-Demand Digital Marketing Talent” now. 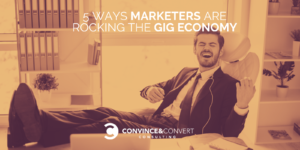 The gig economy is opening up a whole world of creative collaboration for marketers, and these are just 5 ways they’re rocking it. 1. Behind the music: On-demand marketers are working behind the scenes to do the heavy lifting. So I may be an anomaly because I love research. I mean, I really love it. But it’s what has allowed me to put out some best-selling books that give people real, actionable advice based on data and details. But many a marketing team is ready to get to the deployable creative without doing the background research and strategy. After all, where’s the glamour in that? Marketing strategy flexperts, though, they’re up for doing the research. Doing the reading and the planning and the pesky old task of figuring out if and how an idea will actually work. So, busy marketing teams are turning to on-demand strategists to do the “behind the music” blah-blah-blah and then pass it back to them to do the fun part. 2. One-hit wonders: On-demand marketers are executing one-off projects for teams. We’ve all been there when the big boss (that’s me at Convince & Convert, so of course my team is excluded here) comes up with a big idea and your already-overworked marketing team is expected to work it into your already-overloaded priorities. On-demand marketers are taking the pressure off in-house teams by taking on the “one-hit wonders”, while the crew on the ground stays focused on daily deliverables and ongoing objectives. If the one-off is a success — and it goes into regular rotation — the flexpert’s work becomes the pattern to follow for future deployments. So the work keeps on giving long after the freelance house lights come up. 3. Stand-in for a set: Freelance flexperts are filling in when your team is out. Few and far between are the marketing teams that are so generously staffed that losing a team member to maternity leave or a month-long cruise to the Bahamas is easy to absorb for the castaways left on the island. Freelance flexperts are becoming the go-to solution for long- or short-term “stand-in” assignments because they know marketing, they know their role in the process, and they can contribute from day one. Not only does this allow the remaining team to continue to focus on the tasks at hand, but it gives the absent staffer less angst about leaving the band without someone to keep the drum beat steady. 4. Studio musician solution: Freelance marketers are filling your talent gaps. Especially in small marketing teams, key roles — or key experience, talents or instruments, so to speak — are missing. Where a band might book a “studio musician” to play the fiddle on a couple of tunes, many marketing teams are looking to flexperts to rock a certain skill set their team doesn’t have. From designers to copywriters to digital automation specialists, flexperts are filling the gaps on marketing teams in a way that saves precious budget dollars a full-time hire would not. Plus, because they bring a level of flexpertise to the role, companies are getting top-notch skills that a headcount figure might not come close to buying. 5. Band plays on: Freelance marketers fill in while your team is in transition. It’s not fun, but we’ve all been there: transition. Few embrace change (surely you’ve heard of the poor mouse whose cheese was moved), but flexperts from the outside who don’t have skin in the awkward adjustment game that is corporate transition can help keep a marketing plan afloat while the in-house folks try to find a new equilibrium. That’s why lots of teams in the midst of transition are turning to marketing flexperts to help the “band play on” while the staff and corporate objectives are in flux. Without adding pressure, particularly if said transition involves downsizing of people and upsizing of deliverables, turning to flexpertise has allowed these teams to breathe a little easier. If you’re not familiar with Torchlite, check them out. They’re a great resource for companies and marketers looking to find a flexible fit. Make sure to download your free copy of “Flexpertise: Your Guide to On-Demand Digital Marketing Talent” as well. It’s the Lyft of marketing flexpertise. And you’re guaranteed to enjoy the ride.